One of the key factors in success is being good at time management. If you don’t have some sort of routine or schedule, you won’t have value for time. And time is essential when you’re building a business or trying to improve your life habits or achieve a goal of some sort. With proper time management, you prioritize things a lot better and be far more productive. Many of the world’s most successful people follow a routine and it’s important that you do the same if you want to get far in your endeavours. 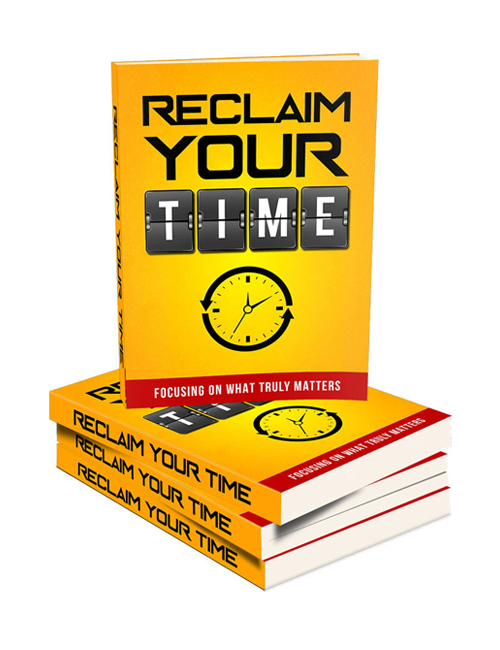 In this guide which supplements the Reclaim Your Time Video Course, you will learn how to change your habits to become more productive, how to figure out what you really want in life, how to prioritize and strategize, how to stop wasting so much time on the computer, how to say no to people who take up your time, how to manage your personal time and much more. It’s important to note that by not keeping a more watchful eye on your time, you end up wasting those crucial moments, hours, days, weeks, months and even years…all because of laziness, procrastination, and the lack of urgency. Once you learn to prioritize and make a real schedule, that’s when things will truly get done. If you want to know how much more helpful it can be to appreciate time, grab this guide now.